Melt the blackcurrant pulp. Add the sieved flour, butter and sugar. Whip energetically and then leave in the fridge to cool for at least one hour. Spread it out on a non-sticking baking tray and cut out rectangles of +/- 10 x 15 cm. Cook in the oven for 2 to 3 minutes at 220°. Leave the tray to cool for 1 to 2 minutes. Take off the biscuits with the help of a thin spatula and roll them with the help of any round kitchen (whisky) that has a diameter of +/- 2,5 cm. Leave them to cool for 30 seconds before withdrawing. 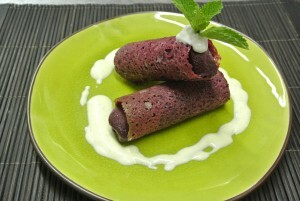 It is easier to use shop frozen blackcurrant pulp. Leave it to thaw just enough to be able to cut it into pieces about the size of a walnut. Put everything into a mixer and add the lemon, the sugar and the mascarpone. Mix until you get a smooth texture. Pour the content of the bowl into a pastry bag and replace everything in the freezer for about 30 minutes to enable it to set. Cut out the end of the pastry bag. Place the cannelloni vertically and fill these “tubes”. All this preparation can be done in advance, for example the day before. Place the cannelloni on a plate along of a good spoonful of custard and a little line of blackcurrant liqueur over the top. For both preparations, you can replace the blackcurrant pulp with a sorbet from a shop. In which case you only have to diminish the amount of sugar used. If your biscuits harden before you have time to roll them, just pop them back into the oven for a few seconds and start again. This recipe has been created by the restaurant Le Chef Coq, Nuits-Saint-Georges, France and is displayed and kindly shared by the Cassissium.